Posted on 9th August 2016 in "Times Square"
5. TIM CURRY stars as an all-night disc jockey, who, perched in his studio high above Times Square follows and encourages the progress of the runaway girls, who thanks to his efforts become minor media celebrities. 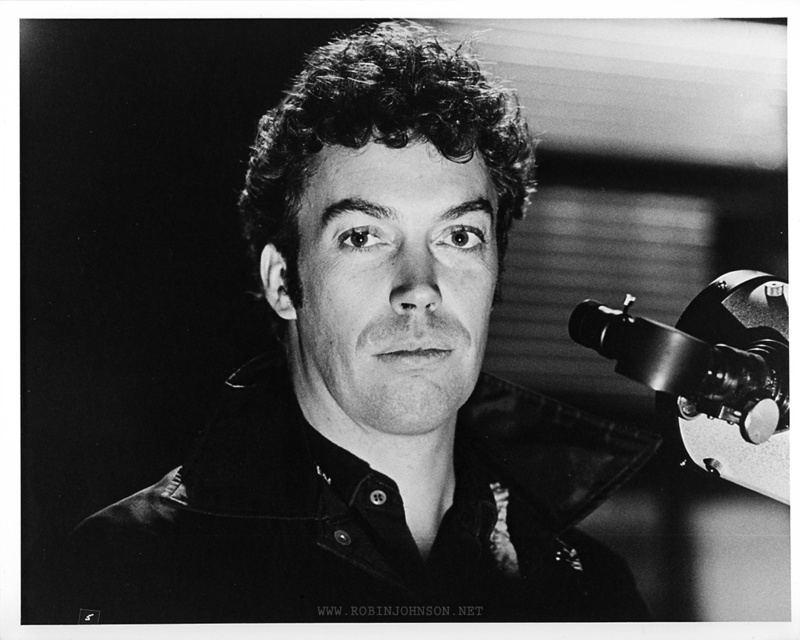 UK Press Kit photo #5 is another headshot of Tim Curry, this time as Johnny appears at the end of the film as he’s watching the concert though his telescope on the deck outside WJAD. The most interesting thing about this photo is, at first glance it looks like TS-79-28/8 from the US press kit, but it isn’t. It’s not just cropped differently; Tim’s head is tilted up slightly and he hasn’t got the beginnings of a smile he sports in the US photo. It’s a different photo, taken just before or just after. Photos 6, 7, and 8 are pictures of Robin. Unfortunately I don’t have Photo 6, and none of the photos without the little number are of Robin alone. 6/7/8. 15-year-old screen newcomer ROBIN JOHNSON stars as Nicky Marotta, a street-wise young runaway who, thanks to a radio DJ’s patronage, is able to fulfil her fantasies of becoming a star of the “new wave”. 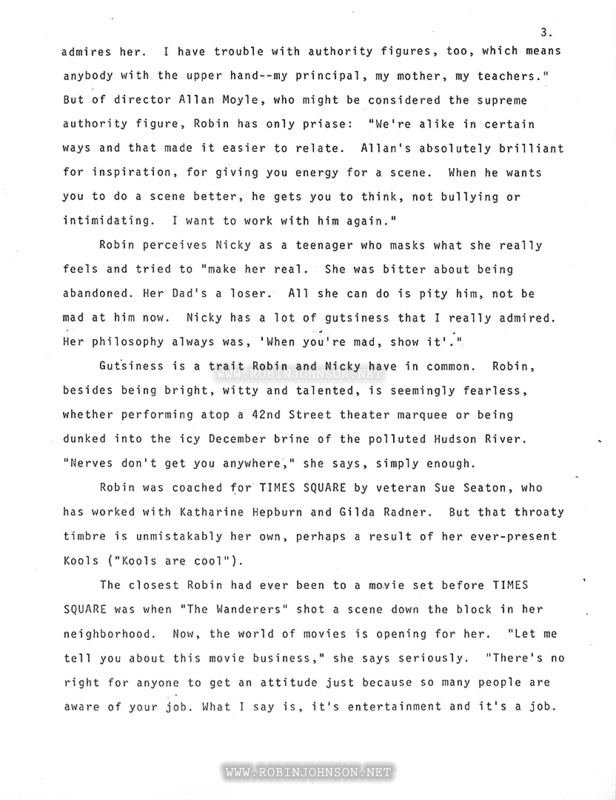 In Photo 7, Nicky kneels at the edge of the Times Square Theater marquee, deciding if she wants to perform or not. She never looks up in the film like she’s doing here, though, not without turning to look at Pammy or the Blondells. Perhaps she’s waiting here for a cue from Allan Moyle. Photo 8 has Nicky scoping out the Cleo Club for Pammy, before revealing her attempt at poetry to her. This one is really close to the shot as it appears in the film, but it isn’t. The POV is slightly to the left of the movie camera, and although Robin is doing the same nervous finger-pulling, her hands are never in that exact position. This is the same almost-but-not-quite situation we saw with the shots of Trini from the later scene in the club where Mr. Pearl confronts Pammy. I don’t have any photos numbered 9 or 10, and the caption sheet has no entries for them. 11. 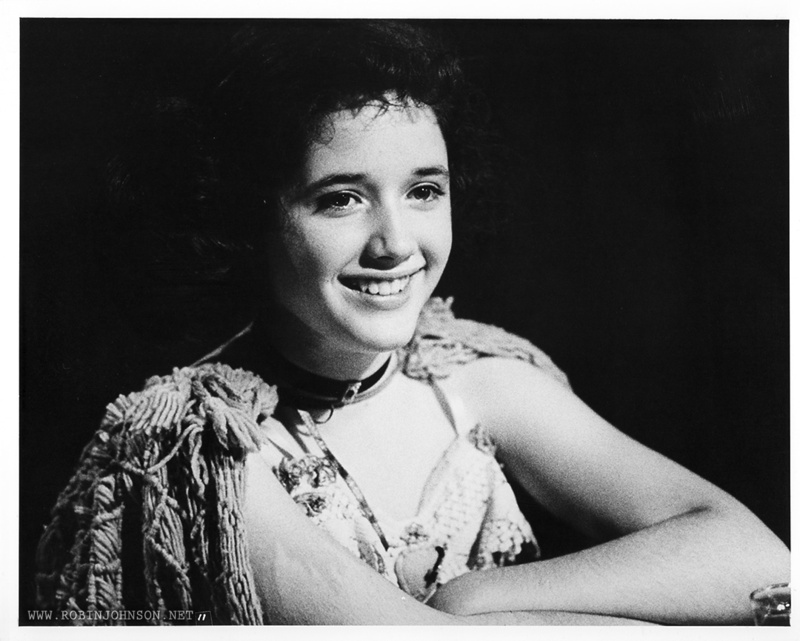 TRINI ALVARADO, 12-year-old star of Robert Altman’s RICH KIDS, is Pamela Pearl, daughter of a well-to-do New York family who runs away to find a new and exciting life in the city’s streets. 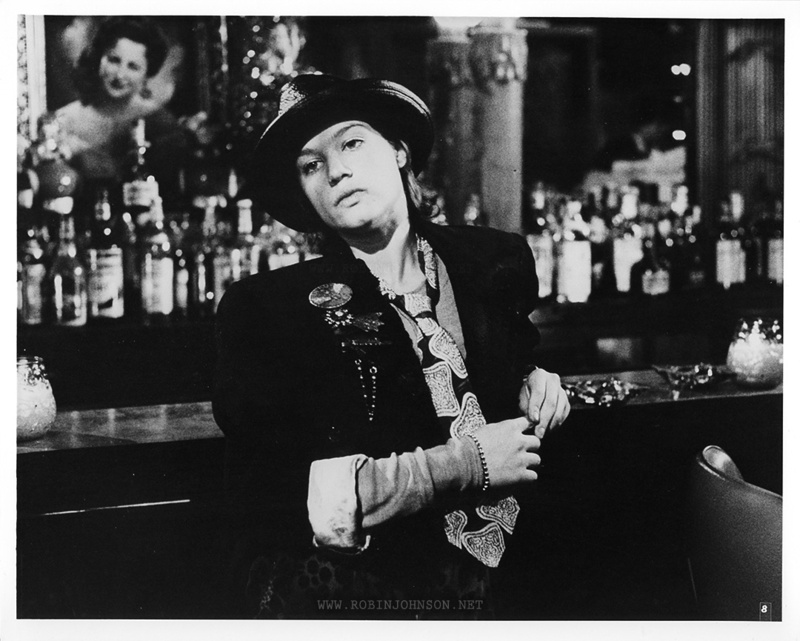 Photo 11 is a shot of Trini from the end of the same scene in the Cleo Club as Photo 8. In the film she never looks in thIS direction while smiling. Also, this photo has been lit in such a way as to make the background disappear entirely. The photographer took the opportunity to make this a true glamor portrait, not just an on-set publicity still. The glass on the table by her elbow shows that it was taken on the set, though. Most of the photos in the UK Press Kit are very grainy and dusty compared to the US photos, as if they were printed from copies themselves. I’ve cleaned up the dust and scratches that were on the physical copy of the prints, but I’ve left most of the ones that were in the print itself, except the ones that were so huge I couldn’t stand to leave them. 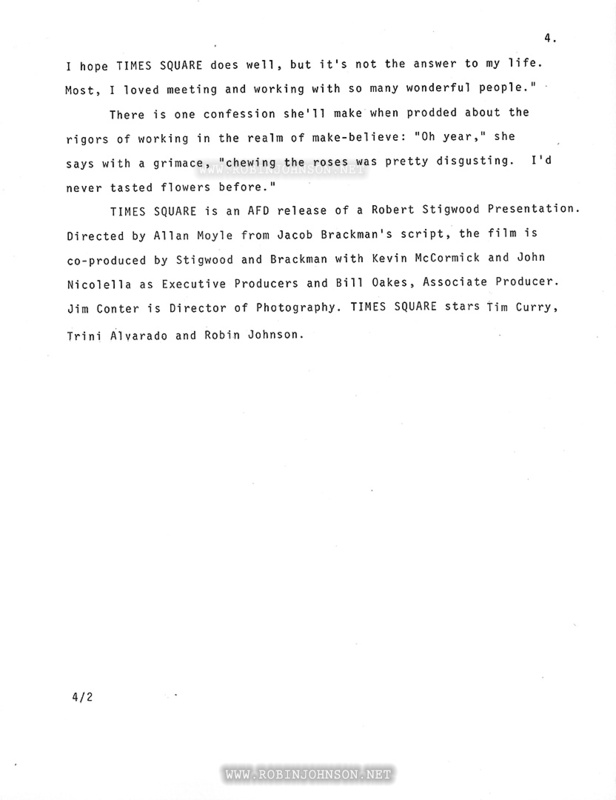 The only difference between the two sets in the UK Press Kit is that the text on the pages without the Times Square letterhead contain American spellings of words, and the pages with Times Square letterhead contain British spellings (“centers”/”centres”, etc.). One day Brooklyn’s Technological High School’s front steps may be legendary as the spot where a star was “born”, a ’79 equivalent to Hollywood’s Schwab’s Drug Store, On those steps, smoking a cigarette while waiting for classes to begin, 15 —year—old ROBIN JOHNSON was discovered by a casting scout on the lookout for possible candidates for the lead in TIMES SQUARE. 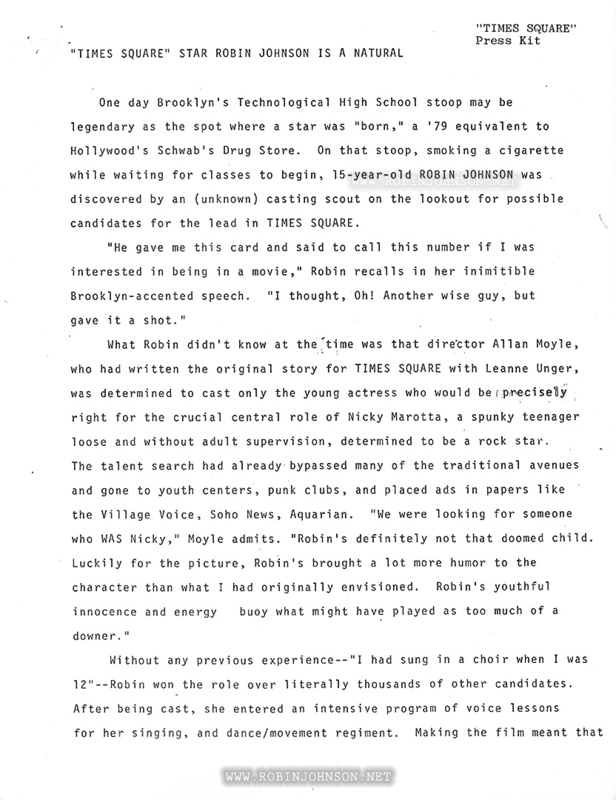 What Robin didn’t know at the time was that director Allan Moyle, who had written the original story for TIMES SQUARE with Leanne Unger, was determined to cast only the young actress who would be precisely right for the crucial central role of Nicky Marotta, a gusty teenager, loose and without adult super- vision and determined to be a rock star. Without any previous experience – “I had sung in a choir when I was 12” – Robin won the role over literally thousands of other candidates. After being cast, she entered an intensive programme of coaching in singing and dance/movement. Making the film meant that the novice was quickly transformed into a seasoned professional. Robin worked seven days a week for three months, for as a minor, the new star had to continue her studies with a tutor on the set and more lessons on Saturday. On Sunday, recording or dancing demands would take up the day. 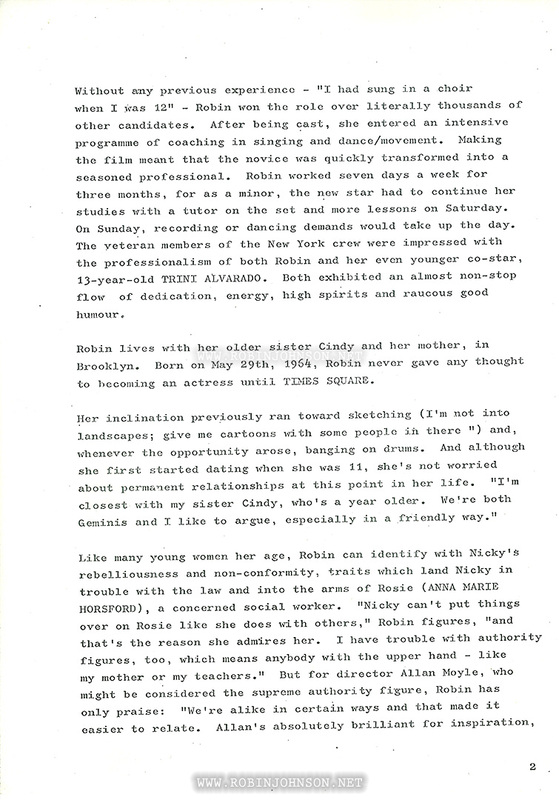 The veteran members of the New York crew were impressed with the professionalism of both Robin and her even younger co-star, 13-year-old TRINI ALVARADO. Both exhibited an almost non-stop flow of dedication, energy, high spirits and raucous good humour. Robin lives with her older sister Cindy and her mother, in- Brooklyn. Born on May 29th,	1964, Robin never gave any thought to becoming an actress until TIMES SQUARE. Gutsiness is a trait Robin and Nicky have in common. Robin, besides being bright, witty and talented, is seemingly fearless, whether performing atop a 42nd Street theatre marquee or being dunked into the icy December water of the polluted Hudson River. “Nerves don’t get you anywhere,” she says. 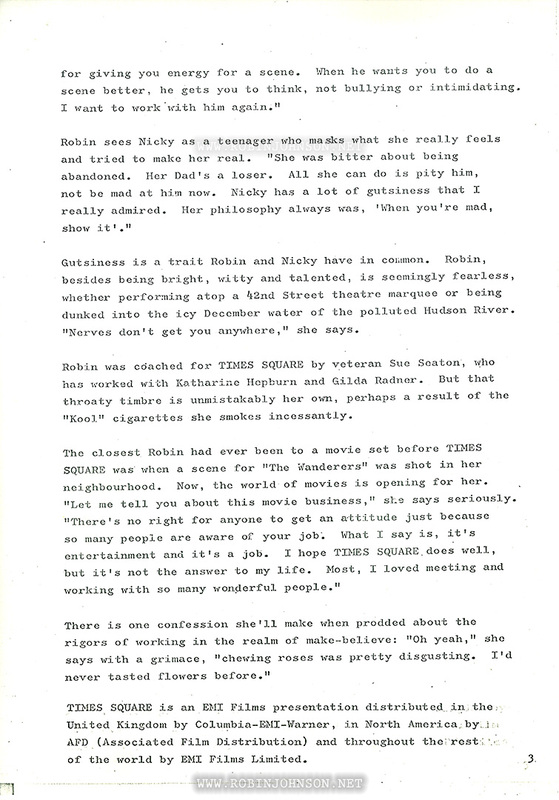 Robin was coached for TIMES SQUARE by veteran Sue Seaton, who has worked with Katharine Hepburn and Gilda Radner, But that throaty timbre is unmistakably her own, perhaps a result of the ”Kool” cigarettes she smokes incessantly. The closest Robin had ever been to a movie set before TIMES SQUARE was when a scene for “The Wanderers” was shot in her neighbourhood. Now, the world of movies is opening for her. Two things of interest, both in the credits as listed in the letterhead: first, the order of the cast. 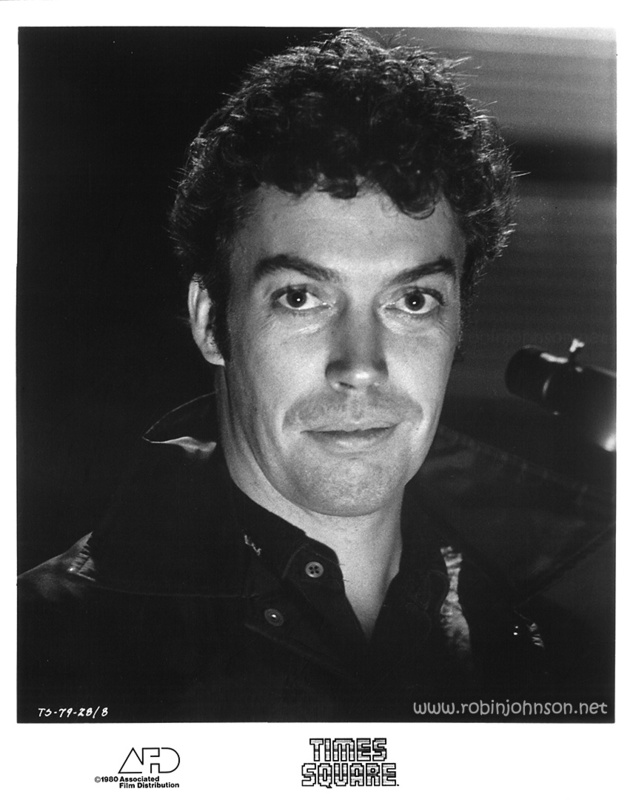 The film’s credits are “Starring TIM CURRY, TRINI ALVARADO, and introducing ROBIN JOHNSON as Nicky.” This letterhead’s credits read “Starring ROBIN JOHNSON, TRINI ALVARADO and TIM CURRY.” So, for a brief moment, Robin had top billing. Second, I just noticed… all the promotional materials, as well as the film itself, misspell Leanne Ungar’s name “Unger”. Of course, in Moyle’s earlier film The Rubber Gun (1977), she had a music engineering credit that spelled her name “Lianne Ungen,” so I suppose this was a step up.